Easing the detangling process, and decreasing the amount of breakage from tangles. Providing flexible styling options -- transitioners can enjoy twist-outs, braid-outs, bantu knot-outs, Curlformers, flexi rods, and more on stretched hair. Allowing you to show more length. One of the hardest things about transitioning is when that shrinkage kicks in around months 4 and 5 -- your hair begins to seem shorter than it was. It can be quite a shock to ladies used to seeing longer, flowing locks as their hair grows. Stretching will help ease that. How can you safely stretch your hair and prevent breakage at the same time? Here are 3 gentle ways to make it happen. Use ouchless scrunchies to ensure that you don't end up with breakage and hair caught metal clasps. Moisturize sections properly prior to banding to prevent breakage. Don't wrap the scrunchies too tightly at the roots. Your edges will thank you. Make sure hair is dry prior to releasing the scrunchies. Otherwise, your hair will shrink right back up. Use a leave-in, heat protectant, or blow-drying cream to delay water loss from within the cortex of the hair, helping to maintain elasticity and internal moisture balance. Keep the blow dryer moving, and do not stay in one section for too long (to prevent hair from drying out). Make sure you're deep conditioning regularly to maintain moisture, elasticity, cuticle health, and prevent heat damage, breakage, and split ends. Don't use too much product. Stick, tack, and shellac city. Make sure the hair lies flush along the roller, for the sleekest results. Hair should be pulled taut at the roots, to ensure elongation and smoothness. Make sure your rollers are secure! There's no quicker style killer than a halfway dry roller that falls off and leaves you with frizzy hair (and that's not the look you're going for). Which method will you be trying to stretch your transitioning tresses? 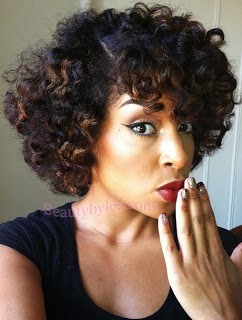 These methods work for completely transitioned natural hair, too!